Made with raw construction materials, found domestic objects, and a painting created by the artist, Planetarium Projector uses conventions from cinema and theater to provoke questions about the differences between art and artifice. A spur wall divides the composition into "outside" and "inside," but our sense of what constitutes these spaces is sketchy at best, dislocated by details like the incompleteness of the yellow paint on the wall and the strangeness of the "sci-fi" painting of a projector shooting its images of stars back out into the universe. 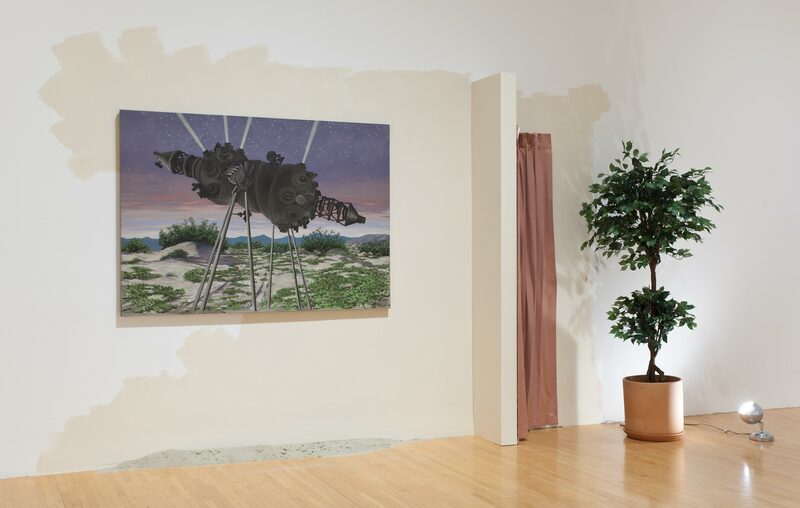 Drawing on the language of Hollywood stage sets, Leavitt's scenes also function as a critique of American culture. His built environments, drawings, and photographs portray odd scenes of domestic life, carefully composed yet often appearing to have been abandoned, as though everyone has fled some unseen threat. "Planetarium Projector." Take It or Leave It: Institution, Image, Ideology Digital Archive. Los Angeles: Hammer Museum, 2017. https://​hammer.ucla.edu/​take-it-or-leave-it/​art/​planetarium-projector/​.